One of the best supported "support" acts to the BTCC is the Porsche Carrera cup, which must also rank as one of the most successful one make series in the UK as well. With a grid of 25 cars it's certainly a great addition to the BTCC calendar. Here's a round up of the latest action from Snetterton last weekend. 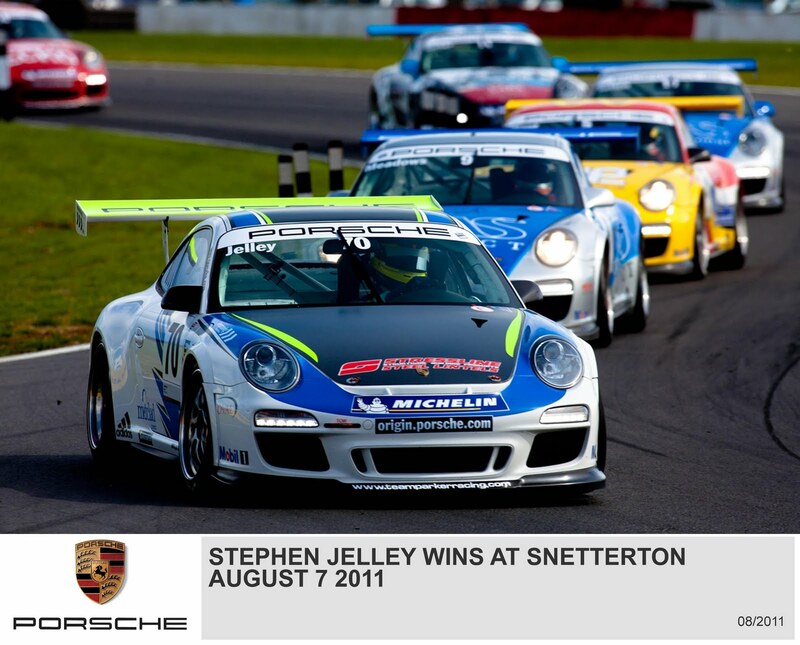 Stephen Jelley scored a hugely important victory in a superb round 10 of the Carrera Cup GB. After 14 laps of the Snetterton 300 circuit, little more than two seconds split the top five cars and victory for Jelley put him to the head of the title race. Michael Meadows and impressive championship newcomer, Ben Barker, completed the overall podium, while the action continued all the way down the 25-car field. Jonas Gelzinis took Pro-Am1 as a fierce battle raged over second place, while Keith Webster beat George Brewster by less than half a second in Pro-Am2 after both had spins. The 25-car field of 450 hp 911 GT3 Cup cars made a fabulous sight on the Snetterton grid and it was Meadows (Banbury) who led the pack away from pole. However, into Agostini’s hairpin on the opening lap, Jelley (Leicester) spotted a gap and dived ahead. “He left the door open and I went for it,” said Jelley. “I was a bit hesitant on the brakes,” said Meadows. Porsche Carrera Cup GB scholarship winner Ben Hetherington (Cheshire) burst through to lie third off the grid, but was adjudged to have jumped the start and had to take a drive through penalty. As Jelley and Meadows settled into a rhythm at the head of the field, it was Barker (Clare, Suffolk) who was on the move and, from sixth on the opening lap, he passed Richard Plant (Sheffield) and Euan Hankey (Taunton) to take third as Hetherington took his penalty. Once clear in third, Barker set about closing the gap to the leaders and set the fastest lap of the race as he reeled in Jelley and Meadows. With five laps to run, Barker – an Englishman who has been racing in the Carrera Cup Championship in Australia – made it a three car contest for the lead and his arrival on Meadows’ tail gave Jelley a slight breathing space. Plant had a fine run to fourth to match his best result of the season, while Hankey was right on his tail in fifth. Pro-Am1 winner Gelzinis (Lithuania) was sixth overall ahead of former Championship leader James Sutton (London) who just didn’t have the pace to make up any places. Gelzinis was away and clear in Pro-Am1 and had to fend off Sutton in the early laps. “It was a bit difficult when Sutton was behind me, but I managed to pull away,” said the Lithuanian racer. The battle for second and third in Pro-Am1 was far less settled, however, and a fierce contest raged between Derek Pierce (West Kilbride), Ahmad Al Harthy (Oman), Rory Butcher (Kirkcaldy) and Freddy Nordstrom (Weybridge). Eventually, Al Harthy spun at Riches after contact with Martin, and Pierce spun on the infield after a clash with Butcher and it was Martin who took second from Butcher as Daniele Perfetti (Italy) took fourth from the recovering Pierce. Jelley made it a perfect weekend in Norfolk when he won round 11 of the Carrera Cup GB to make it a double victory in a very important weekend for his title bid. Meadows again chased Jelley home as they both moved ahead of erstwhile Championship leader Sutton; Jelley now has an 11-point lead in the table. Gelzinis doubled up in Pro-Am1, while Pro-Am2 was only decided at the final corner when Webster dived ahead of Ozbek. Jelley raced ahead from pole position and controlled the race from the front while under pressure from Meadows. After an early Safety Car period, Meadows mounted a concerted attack but Jelley was able to match his rival and then edged clear over the second half of the race. “We seemed to have the legs after the first quarter of the race,” said Jelley. “To outscore Michael Meadows and James Sutton is what we wanted.” Meadows chased Jelley to the flag, but was fortunate to make the finish in second as a slow rear puncture struck with four laps to run. Into his first Carrera Cup podium finish was Plant, after spending the entire race containing the challenge of Sutton. It was 15 laps of pressure for Plant, but he was equal to the task and was delighted with his best Carrera Cup result to date. “To be at the front with the big guys was great, but that was hard work,” said Plant. For Sutton it was a case of damage limitation during a trying weekend when he did not quite have the pace to challenge for victory. Right behind Plant and Sutton were Barker and Hankey in a fast-moving train of cars that also included Gelzinis, Hetherington and Sam Tordoff (Leeds). Barker’s excellent pace helped earn the ‘Team of the Weekend’ award for Parr Motorsport. Gelzinis extended his Pro-Am1 advantage with his second category win of the weekend. “I tried to fight with Euan and that stressed the tyres a little bit,” said Gelzinis. “It was very hard to control the car later in the race.” Over the first half of the race, a tremendous battle raged over second place in Pro-Am1 as Pierce headed Butcher, Al Harthy, Alex Martin (Somerset) and Nordstrom. Pierce defended resolutely for several laps before Butcher edged ahead at Agostini’s hairpin. Once ahead, Butcher pulled quickly away for a secure second in Pro-Am1. “It was another really hard fight with Derek,” said Butcher. Despite constant pressure from Martin, Pierce completed the Pro-Am1 podium. “It’s been a hard day,” said Pierce. The Pro-Am2 contest ran right to the very last corner of the race as Webster mounted a relentless chase of his Redline Racing team-mate Ozbek. Then, as they braked for Murray’s chicane for the last time, Webster scythed ahead in a spectacular move to take victory and help earn the ‘Driver of the Weekend’ award. “The Bomb Hole was the one place I was quicker and that set up the move,” said Webster. “That’s the best I’ve driven all weekend,” he added. Ozbek salvaged second place while Steve Parish (London) recovered to take third after Brewster hit alternator problems early in the race. 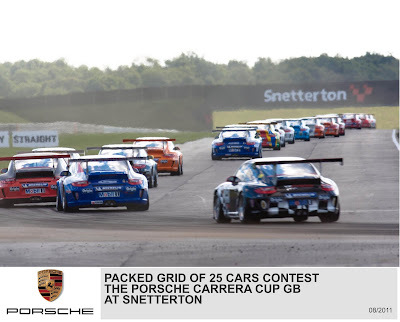 The 2011 Porsche Carrera Cup GB Championship moves to Knockhill in Fife, Scotland, for the next rounds on September 3/4.